View of Puuhonua O Hanaunau National Historical Park. Interested in learning more about the rich culture of ancient Hawaiians? 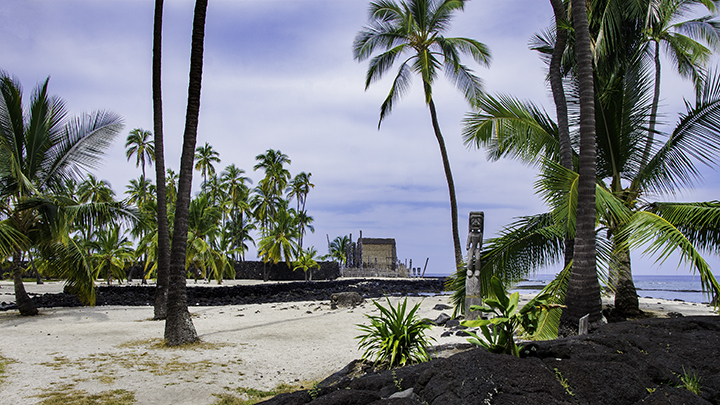 If so, you should visit the Big Island’s Puuhonua O Hanaunau National Historical Park. White sand beaches and the blue waters of Honaunau Bay and Keone’ele Cove surround the park’s 420 acres. The park is home to buildings, cultural artifacts, works of art and archeological sites spanning 400 years. Making it an even more fascinating place to visit are the self-guided tours, walking trails and daily ranger talks. Pu’uhonua ‘O Hanaunau or Place of Refuge was a sacred place for ancient Hawaiians. Any lawbreaker making their way here and then receiving absolution from a kahuna (priest) could find sanctuary here. This even included those who were given death sentences. Surrounding the sanctuary is a tremendous Great Wall. The L-shaped 965 foot long structure stands 12 feet tall and 18 feet wide. This historical park showcases the reconstruction of the Hale-o-Keawe Heiau Temple. Around the building are enormous depictions of the gods, Ki’i. They serve to protect and mark the sacred grounds of the temple. The structure honored Keawe’ikekahiali’i o kamoku, the great-grandfather of King Kamehameha I. The heiau is the final resting place for 23 ali’i (chiefs) of Kona. The spirits of these chiefs gave the area its sacred power. Not far from the sanctuary is a mile long trail that stretches along the coast. It offers travelers a beautiful look at the Pacific Ocean. At the end of the trail are the remains of Ki’ilae, a fishing and farming village. Ki’ilae is an example where Hawaiians practiced traditional crafts and farming techniques. In the village, visitors can see traditionally-constructed homes, agricultural artifacts, animal pens and even salt vats. The park’s visitor center opens at 8:30 am every morning and remains open until 4:30 pm. Stop inside to grab an informational guide. Then attend one of the free, twice-daily ranger talks at the park’s beautiful amphitheater. Here, you can learn more about the culture and life of ancient Hawaiians who lived in the area. Between Tuesday and Saturday, visitors can also experience traditional Hawaiian crafts, like carving and weaving.